Between sweet sixteens, graduations, baby showers and random birthdays, the summer and fall is filled with major events for the people I love. I’m always looking for a special gift, something unique that I can’t find on the shelf in a store or in a mass-produced catalog, to go along with whatever else I’m giving. Something that says “I thought of you when I saw this,” rather than “I couldn’t think of anything for you, so I got this.” I’m not knocking gift cards, cash or insanely cool gadgets, I just think sometimes a little something extra can mean a whole lot. That’s what attracted me to Simpli Stamped. 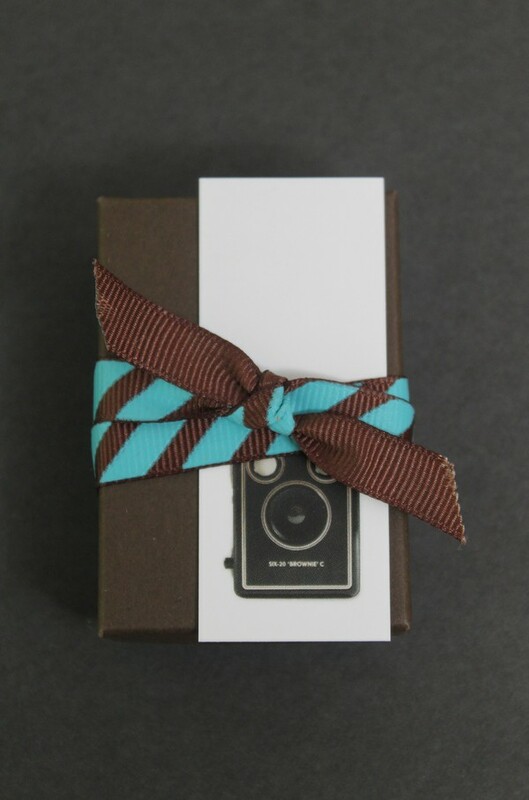 When Amber, the talent behind Simpli Stamped, offered me a piece for review, I had such a difficult time choosing. 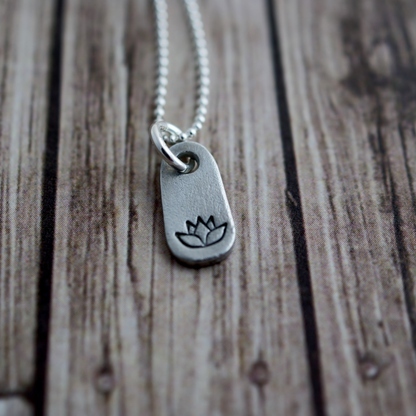 I poured over her website, opening tab after tab of pieces that I adored, before choosing the Teeny Tag Lotus Necklace. There was just something about its simple beauty. I read the description and learned that the Lotus symbolizes rebirth, life, strength, good luck and purity. It was a perfect fit for what I need right now in my life. The photo above is from Simply Stamped’s website. I tried to get a good picture and my skills just didn’t show off the beauty. I didn’t want to give the wrong impression, so forgive me for not including my own picture. The super cute box above, though, I took that picture. I absolutely love it! It’s almost as pretty as what it holds! 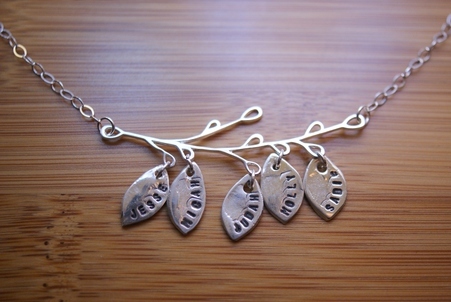 Custom Family Tree Branch necklace, stamped with the names of your family members. You could do this with you and your partner’s names plus your kids, or just your kids. Really, you can put any names on there, so it could be a best friend’s necklace, your pets (I’d need a whole forest) or whatever you want! 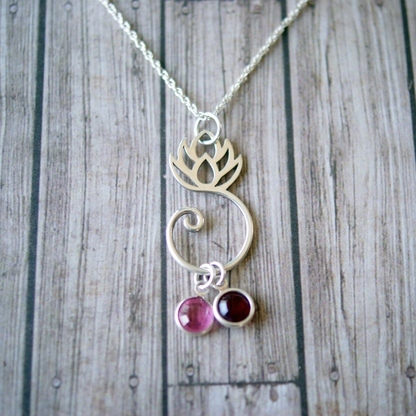 Lotus Birthstone Necklace: This was my other favorite and one that I was really considering. The silver lotus comes with one birthstone. Additional stones are just $5. 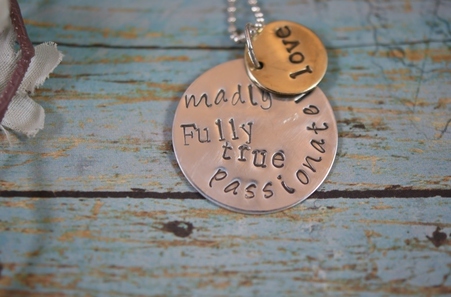 Word of Love Necklace: A beautiful gift for the love of your life, it’s stamped with the words: love madly, passionately, fully, and true. 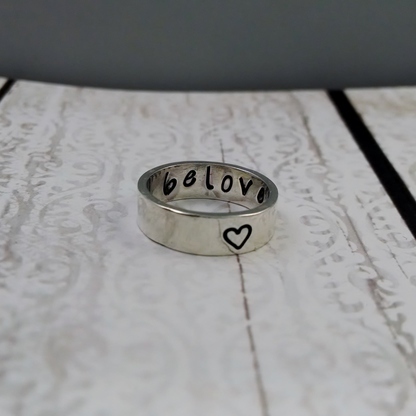 Hand Forged Sterling Silver Ring: The example ring shows a heart on the outside and the word “beloved” inside. You can customize this with your own message. The entire ring is handmade, so they are true-to-size. 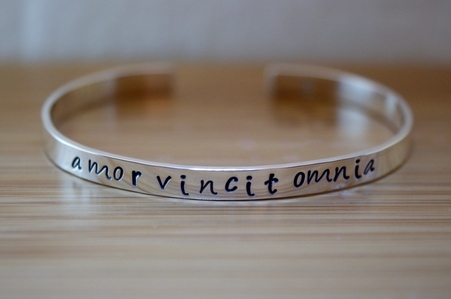 Amor Vinicit Omnia Cuff Bracelet: It means “Love Conquers All. A perfect gift for anyone who needs a reminder of that. Amber doesn’t just create beautiful jewelry, she has a beautiful spirit as well. She is deeply committed to giving back through her work. Her goal is to find a charity each quarter and work with them to create a piece of jewelry (or an accessory), then donate 50% of the proceed from that piece to the charity. She just added Guitars for Glory to her list. She’s created pieces for Living Water International and Love 146 as well. She makes it easy to give back while also giving someone else in your life a meaningful gift. Everything about Simpli Stamped exudes joy, peace, happiness and love. Amber clearly has passion for her art and she puts that passion into her pieces so that you can feel special wearing them. Visit Simpli Stamped to see all her beautiful pieces, explore Amber’s story and learn more about the shop. Follow Simpli Stamped on Instagram to keep up with all the latest designs. Check it out on Twitter and Facebook to keep up with news. I love Jewelry like this because it is dainty and so well made. I have a few pieces like this, but not from Simply Beautiful. One of these pieces would be good for my sister’s birthday next month. I love these. They would definitely make for a nice gift. I know my teenage daughter would love them. I love this kind of stuff. I think it makes for awesome gifts, too! Very pretty stuff. Wow, these are simply beautiful! I have a birthday coming up, I better drop a hint to my family! I love the bangle! There are so many nice pieces to choose from but the silver ring is my favorite. These are so pretty. I really like the idea of getting some personalized pieces with names! The personalized necklaces are always a beautiful gift to give. I agree with what you said about having a difficult time choosing which piece to order to review. I would not know which one beautiful necklace to pick. oh, my! I love all these pieces. They’re so unique, and perfect for gift ideas. Awesome as gifts. I would love to buy one for me too. Awesome idea/designs. Oh wow, these are gorgeous! I love giving custom jewelries to friends and family because they are unique. Oh my goodness, those are beautiful! I really love how each piece stands out, yet is so simple. & I’m really loving that family tree branch necklace! I like this kind of jewelry. Being able to personalize it makes it even better too… I got a piece for my daughter once and she loves it. Very nice items. Great gifts for the hoidays. A great selection to pick from.